Hope it’ll be good tips for you to try! Have you noticed that Geelong has a wonderful library in the heart of city? Luckily enough for me, it is just across from the campus where I study and super close to where I work so I go there often. Although for a while since I arrived, I always passed by but never walked in. But once I did, I loved it. It’s a modern beautiful building with an absolutely comfy atmosphere inside. I highly recommend making use this place if you are a resident here. They open 7 days a week (weekdays till 8pm). A variety of books, CDs and DVDs are available to borrow. Each level is sorted and categorized specifically and maintained very well for easy access. If you have children, there’s a level for kids and youth as well as there’s a level for heritage, if you are interested in local history. They also have free wifi and free computers for anybody who needs to use them. Whenever you feel like a break from your study there’s a cafe on the ground floor or if it’s warm nice day, you can just go outside because the library sits right next to Johnstone Park. Or you can either simply pick up any books from a variety of line up and take an individual sofa which faces the beautiful outside scenery. I love sitting there with a photograph collection. 2) EATING - 80 Cents Doughnuts! The Geelong Showground in East Geelong holds a Sunday Market every week. It’s just a few minutes walk from my place, so I go there when I manage to wake up early on the weekend. It is a nice place for shopping. You can get fresh food, groceries with mostly better prices than you get them from supermarkets. Also it’s a nice spot for social communication as well. You can meet local people and have a chat with them. And DO NOT forget to try the BEST DOUGHNUTS I found in Geelong when you visit the market! It’s a small trailer named “The Donut Man” next to the entrance of the ground. There’s only two simple flavors which are cinnamon sugar and jam. I reckon cinnamon sugar is the best. Believe or not, it’s only 80 cents for one! It is super yummy!! One of the first things I did when I moved to Geelong was to buy a bicycle. I needed it because I don’t have an international drivers license (I am a terrible driver anyway) and I wanted to save the cost of bus travel as much as possible. I usually ride my bike anywhere but not extremely far. To go to school or work is about a 4.5km ride. It takes me 25 minutes, luckily there is no hilly road. And that is always my favorite moment in a day. Especially during summer because I love summer. Riding on shiny hot days is purely fun for me. But even on a sleepy cold winter morning, it is good too. Yeah, sometimes I need to encourage myself a bit against temptation for taking a bus but once I start riding, I feel good. I reckon it is also a good exercise to refresh your brain as well. I feel the air, see the color of the sky and hear the sounds of birds singing. I experience the sun shining and the stars and the moon. Every time, I ride, I feel nature and the seasons. Isn’t it wonderful? For me it’s one of the beautiful things about being in Geelong. Have you ever thought, “I can feel it in a super busy and crowded city like Tokyo as much as I can feel it here?” Of course not. 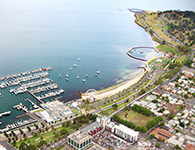 Geelong really is a lovely living environment. Whenever I ride, I’m thankful for taking a part of my life journey here. This is my 1st year of being in Geelong so I haven’t experience spring yet. Some local says, “Spring is the best season here.” I can’t wait to see and feel it!